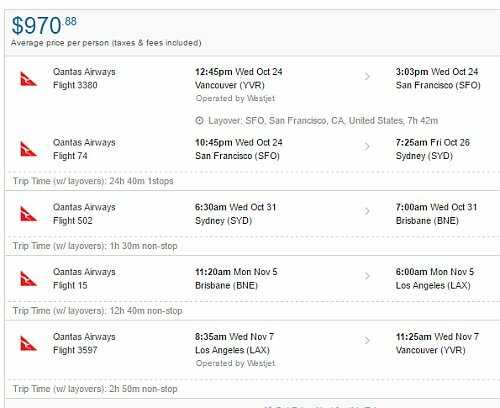 For the first time in quite a while, there are some flights from Vancouver to cities in Australia for under $1000 roundtrip. 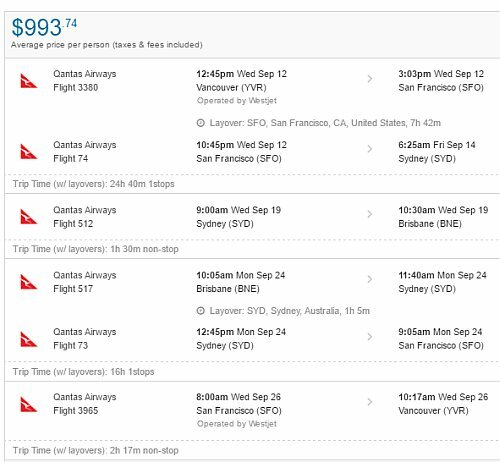 The flights are with Qantas, an excellent airline. 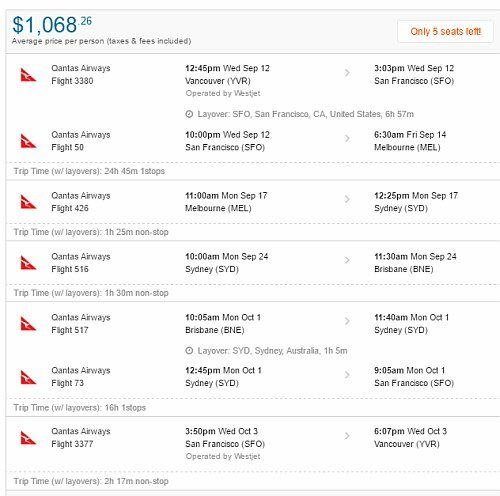 You can also turn these into 2-in-1 trips and visit both Australia and San Francisco (or Los Angeles), for under $1000. 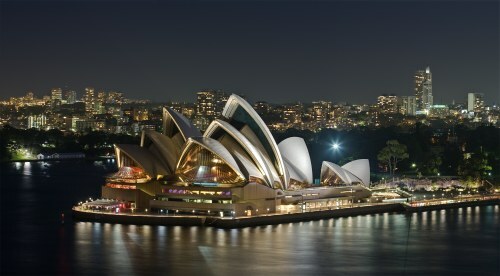 You can also look at flying into one Australian city, but home from another, and keeping the price under $1000. 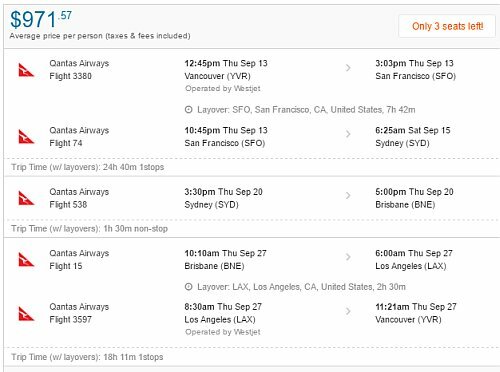 You may be able to find flights out of Victoria (YYJ) for about $80 to $100 more. 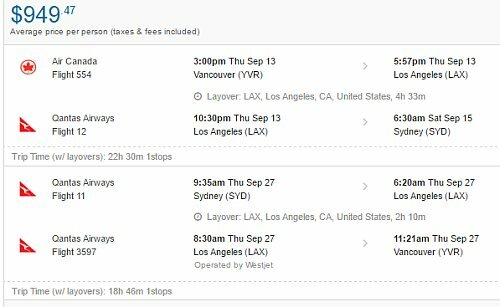 In the past few years, when prices to Australia start to drop significantly, Air Canada has been known to occasionally offer non-stop flights from Vancouver to Sydney or Brisbane for under $1000. No sign of those yet. - look for the dates that are somewhere between $1040 and $1073 roundtrip. NOTE: The first search result on Flighthub may not always be the best flights. Check out the different options on the first page of the results. You may also want to try clicking on '1 stop only' on the left hand side of the Flighthub search results, if it's available. 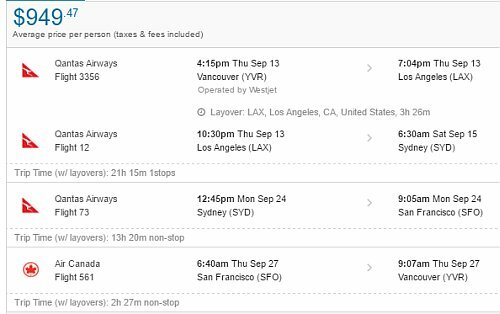 For example, let's say you found a flight from Vancouver (YVR) to Sydney (SYD), from Sep 13 to Sep 27. For example, here is a screenshot from Flighthub of Sep 13 to Sep 24 to Sep 27. For example, here is a screenshot from Flighthub of Sep 13 to Sep 27. 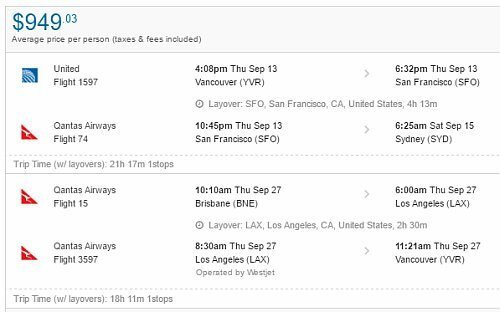 No Responses to "Vancouver to Sydney, Brisbane, or Melbourne, Australia - $949 CAD roundtrip including taxes | add San Francisco for free"